UP Paryatan Vibhag Bharti Latest News 2018 Good after Noon Friends today we will tell you about upcoming UPSSSC Tourism Department Recruitment statement given by Tourism Board of Uttar Pradesh. We all Know that every year in Uttar Pradesh Millions of People around the world visit Sacred Places like Kumbh Mela, Tajmahal, Kumbh Mela:-Hindus Biggest Fate of Hindus gather to bathe in a sacred or holy river, Agra: - Iconic Taj Mahal mausoleum & Agra Fort, Varanasi: - Kashi Vishwanath Temple & Ganges River, Fatehpur Sikri: - Jama Masjid mosque & Salim Chishti tomb and Jim Corbett National Park: - Bengal tigers & Ramganga Reservoir. UP Paryatan Vibhag Junior Assistant Recruitment 2018:- Total 40 Jobs are generated in Tourism Place of Uttar Pradesh which can also be up after suggestion given by tourism board. Talking about Junior Assistant there are 15 posts is here to apply from Uttar Pradesh Sub Ordinate Service Selection Board. 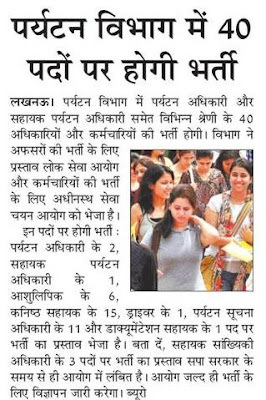 UPSSSC Paryatan Vibhag Recruitment 2018:- In two Stages 40 Vacancies, Written Exam and Typing Test considers by UP Board of Tourism. UPPSC Adhikari ki Bharti Karega however UPSSSC take charge to fill Clerk Group C department posts. Norte? :-We will soon update the Age Limit, Educational Qualification, Selection Process, Application Fees, Starting Date for Application form.